UT Defense is formulated to support microflora balance and natural urinary flow for long term urinary tract health. 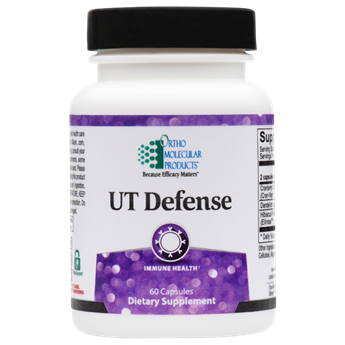 UT Defense is a formula designed to support kidney and urinary tract health and to help to promote microbial balance. The formula includes Cran-Max®, a cranberry extract which boasts antioxidant activity three times higher than cranberry juice and beneficial fiber content. A unique protective delivery system ensures special compounds from cranberry are not destroyed by gastric acid and pass through the lower gastrointestinal tract for absorption into the urinary tract. UT Defense also includes dandelion leaf extract, a natural diuretic, and UTI Rose, an extract of hibiscus flower shown to promote healthy microbial balance in the urinary tract.